Most of the time, Dubai is the only city in UAE that is in news. But, come February and Sharjah is all set to steal the spotlight. If Dubai is associated with modernism and being a futuristic city, Sharjah takes pride in being the cultural capital of UAE. This emirate is brimming with an amazing assortment of cultural and historic structures and has a dedication towards the Arabic art and cultural scene. 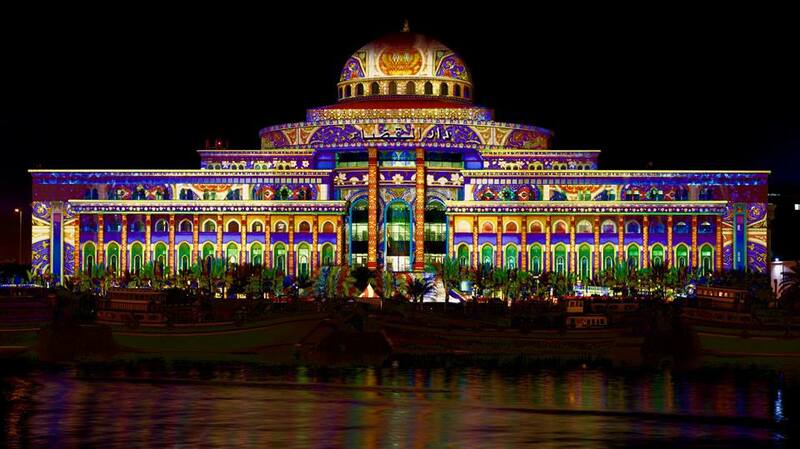 The Sharjah Light Festival further enhances the elegance of the city’s popular landmarks and historic sights. 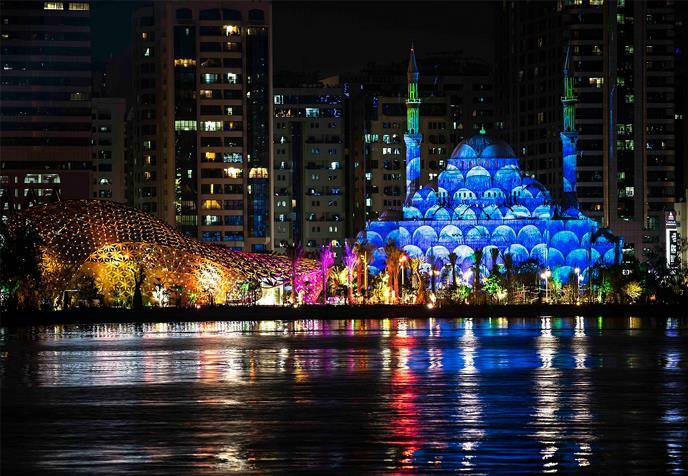 Started in 2011 as a way to allure tourists to witness the splendours of Sharjah’s cultural scene, Sharjah Light Festival illuminates the whole emirate with mesmerizing installations and digital visual spectacles for 11 days. 2019 marks the 9th year of this fascinating festival and brings together an assorted collection of internationally renowned visual designers and digital media artists who make Sharjah’s prominent buildings their canvas for the next 11 days. 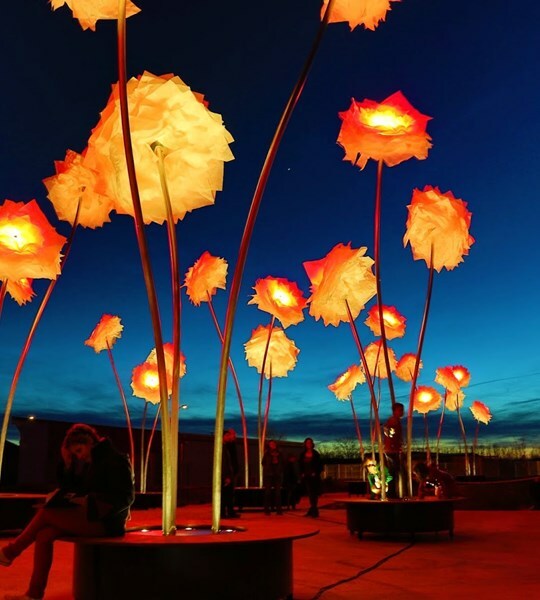 Every year, the festival makes efforts to innovate and enhance its installations by bringing together new techniques of visual projections, technological advancements, new artists and energy saving options for lightings. 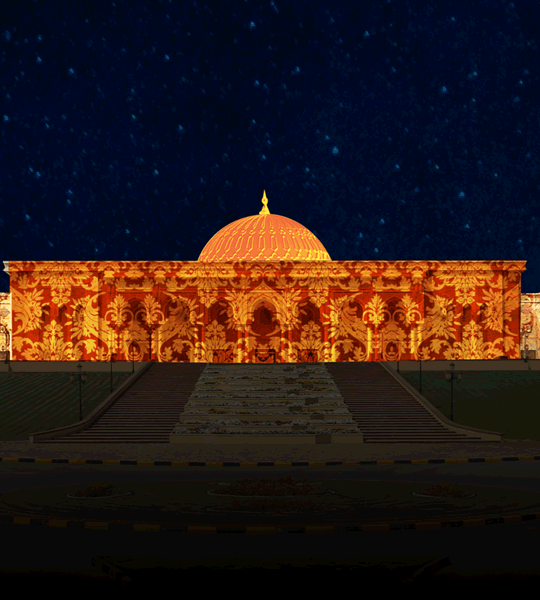 Over the years it has become one of the most sought after event to look forward to while visiting Sharjah so that guests can get to witness this grand spectacle of illumination and heritage fused together. 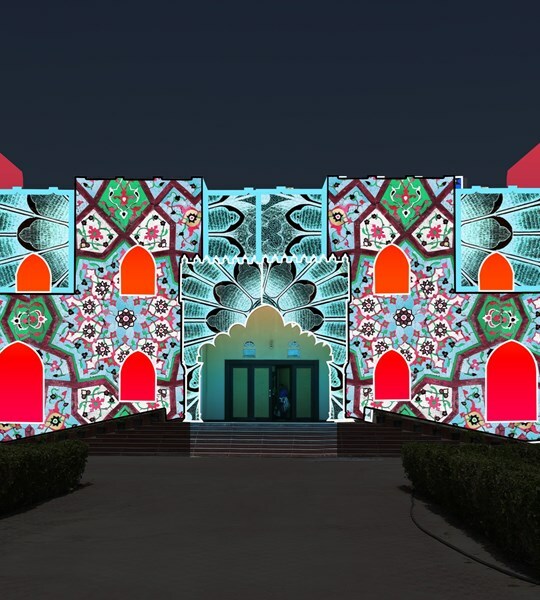 Sharjah Light Festival 2019 dates: 7th to 17th February 2019. 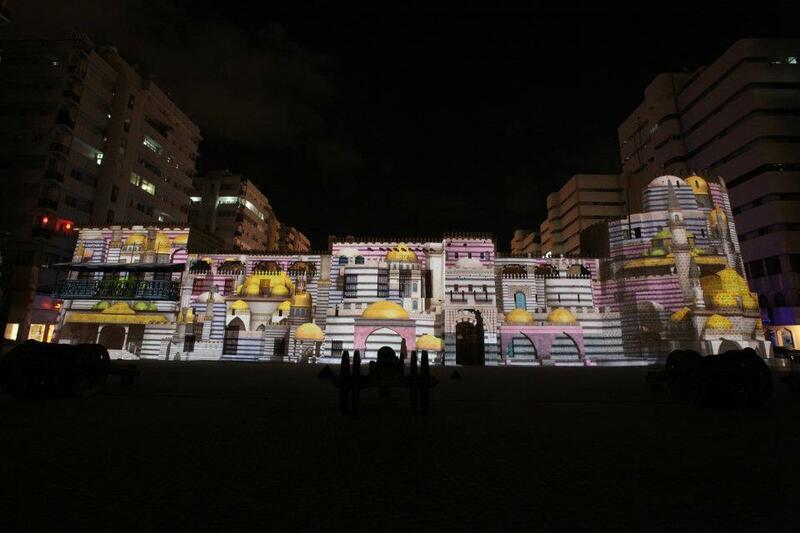 Sharjah Light Festival Timings: Sundays to Thursday: 6 pm to 11 pm, Friday and Saturday: 6 pm to 12 am. 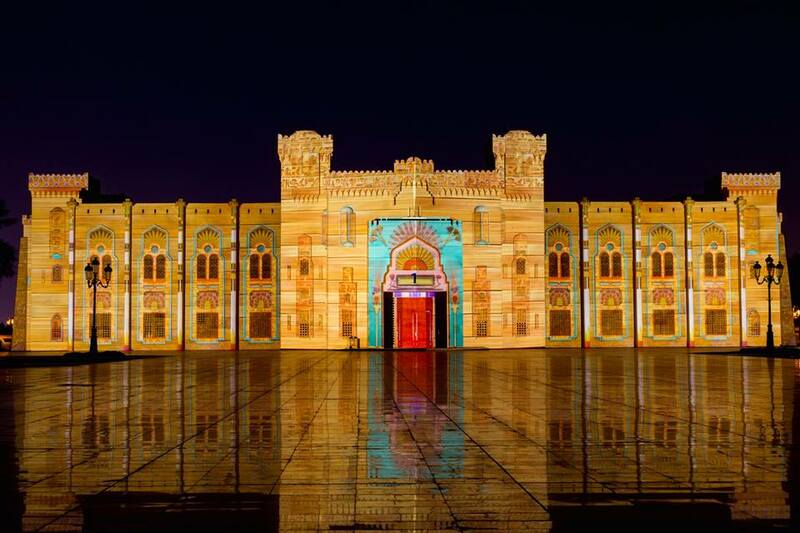 Sharjah Light Festival Locations: The Sharjah Light Festival sprawls throughout the emirate and features life-size light installations and stunning digital projections at more than a dozen famous landmarks and locations. These include Al Hisn Fort, Heart of Sharjah, Kalba, Masjid Al Noor, Masjid Sheikh Rashid Bin Ahmad Al Qassimi, Municipality Buildings, Khorfakkan, Sharjah Police Academy, Supreme Court for Family, University City Hall, Dr. Sultan Al Qasimi Centre for Gulf Studies, House of Justice, Khalid Lagoon, Masjid Ammar Bin Yasser – Al Dhaid, Municipality Building – Al Hamriyah Town, Palm Oasis, Sharjah University City Campus Avenue. Most installations and shows are held at Heart of Sharjah area. Visitors can opt for a Hop On Hop Off City Tour which journeys through all the locations of Sharjah Light Festival. Illustrating that the universe is ever evolving and portraying the passage of time with the sun as the main element, the Spanish creative team – TigreLab beautifully narrates how culture and nature scenarios change through time. Combining high-end digital technology and stellar designing creativity, The University City hall façade turns into a masterpiece canvas to depict the beautiful fusion of vibrant lights and designs. 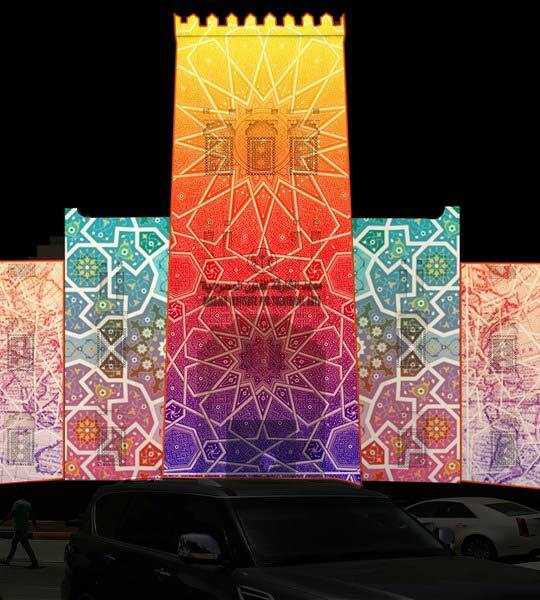 Watch a surreal spectacle of abstract art and collages wrapping every inch of Masjid Al Noor’s façade. Combining bright neon hues with geometrical patterns, Cindy Lo shows her master skills in a fascinating way that further enhances the beauty of this charming architectural gem of Sharjah. Khalid Lagoon transforms into a sea of beams as 32 colourful searchlights sear through the city skyline, in various motions and speed. Artist Nicolas Gauthier showcases a high-impact light show through simple circular movements of several beams of light. 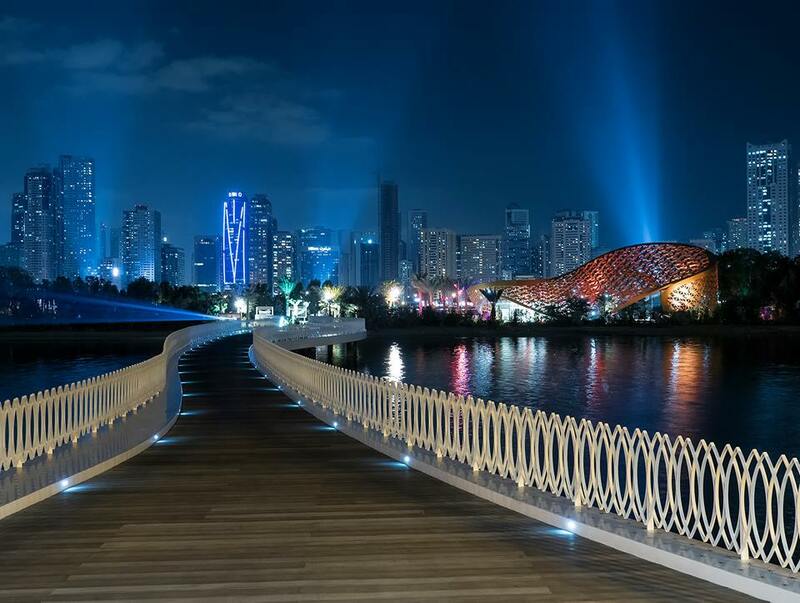 The light show enhances the shimmering ambience of the city and the calm surrounding lagoons. An astounding show put together by Normada Design Team, enter into a realm filled with gleaming lights and interactive illuminations shaped into tunnels and mazes with 14 separate entrances at Palm Oasis. 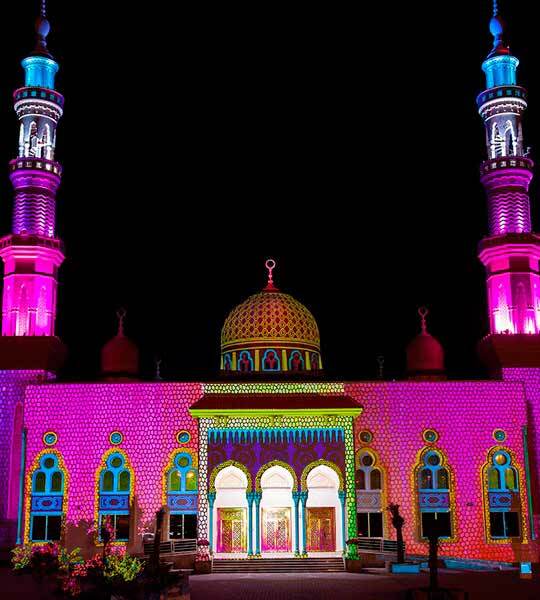 The Cascades of vibrant colours and dancing lights brilliantly drape the exteriors of Masjid Sheikh Rashid Bin Ahmad Al Qassimi. 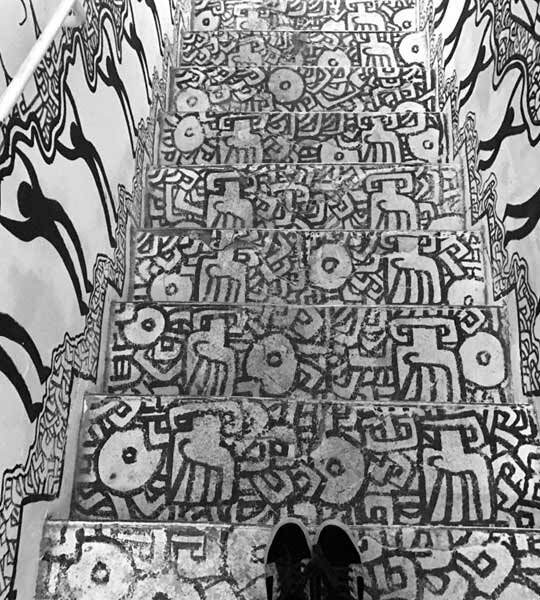 The Waking Dream is an art project presented by Raphaelle Martinez where symmetrical patterns cling on to every surface, corner and curve of this magnificent monument leaving those who witness this spectacle speechless. Created as an oneiric time capsule, this visual creation narrates the story of Arabian development and its journey through history through a dazzling display of brilliant lights and colours. This show is a creation of Mathieu Felix, a French art director who is amazingly talented in blending art and technology seamlessly. The show takes place at Dr. Sultan Al Qasimi Centre for Gulf Studies. 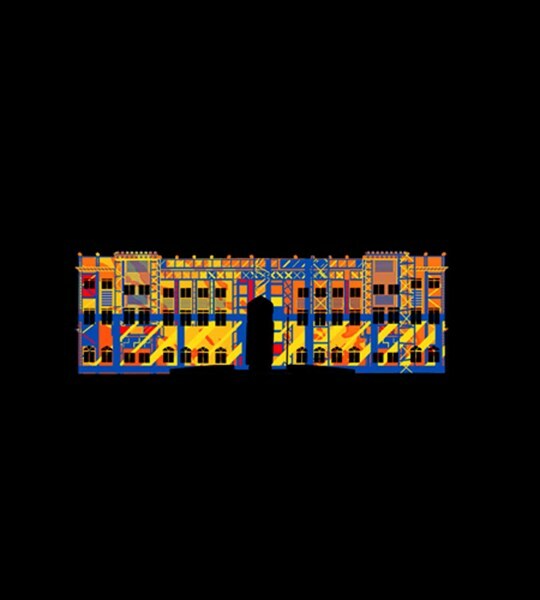 This symphony of colours by artist Arturo wraps the Heart of Sharjah’s buildings and structures in a kaleidoscope of vibrant patterns and designs. The ‘Logbook of a Digital Explorer’ is held at one of the oldest parts of Sharjah which is famous for traditional souks and heritage landmarks. 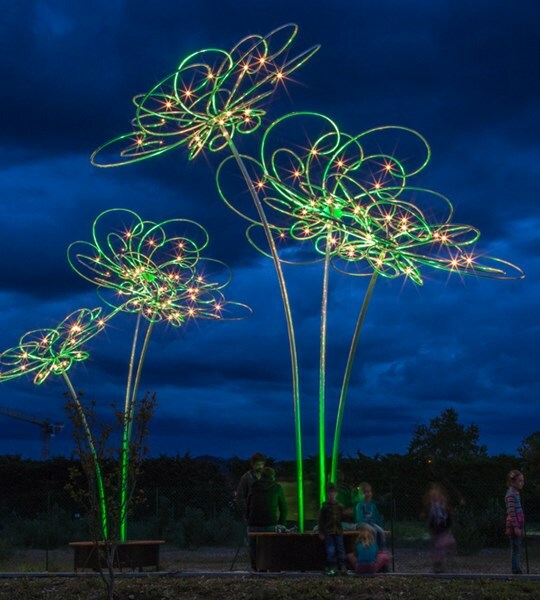 An expert in monumental installation shows, Collectif Coin fuses state of the art technology to brings alive abstract installations with sound, light and digital motion. 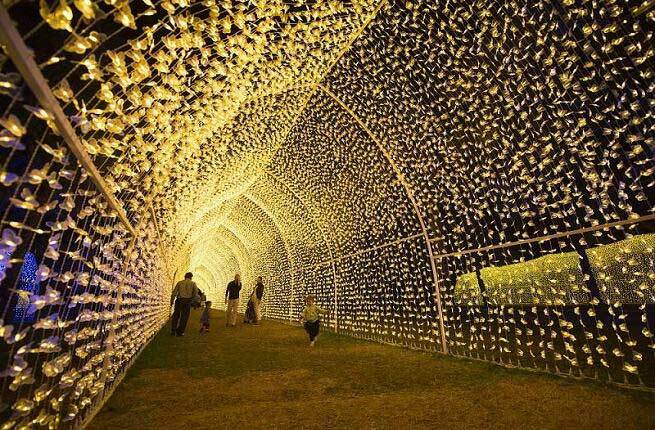 Their installation transforms a mundane landscape into a sea of dancing lights creating mirages of illuminations. 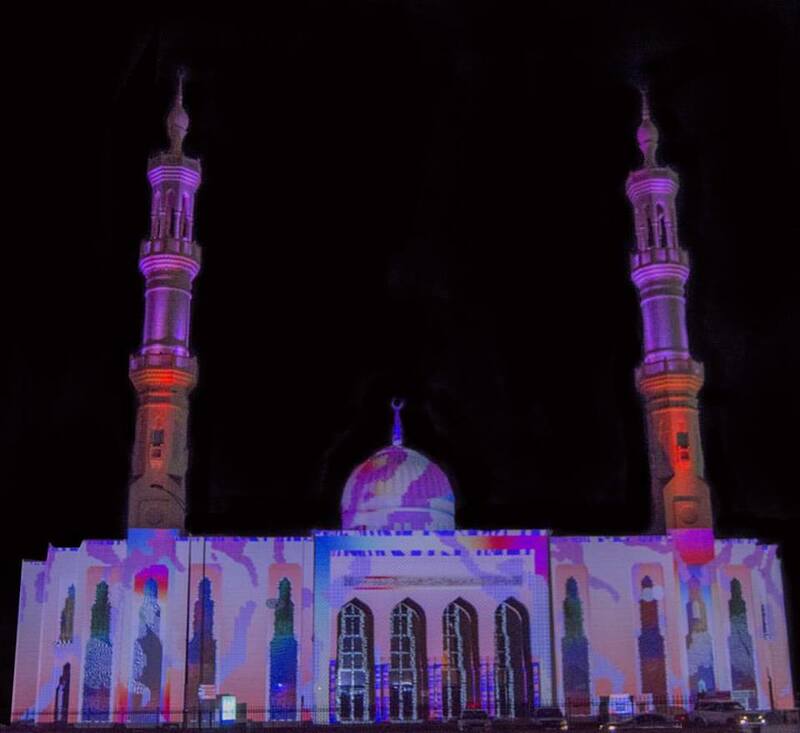 Depicting ideas of purity, eternity and infinity, Graphic Playhouse combines digital visuals of patterns and colours to create surreal illusions on the Heart of Sharjah. A creation by Bijoy KV, the show creates digital illusions that take viewers to a new realm. A graceful representation of vivid colours and poetry, Laurent Langlois creates an extraordinary masterpiece of digital visuals, high-end technology, and poems. This impressive video-mapped show covers the Sharjah Police Academy in an assortment of colours and patterns further enhancing the building’s architectural details. Theo Haggai transforms the Heart of Sharjah’s walls with his thought-provoking cartoons. Made out of simple strokes and lines, this live fresco is dedicated to Sharjah’s encouragement of education, heritage, and culture. The French creative team – TILT transforms the oldest area of Sharjah into a breathtaking imaginary landscape of peonies. 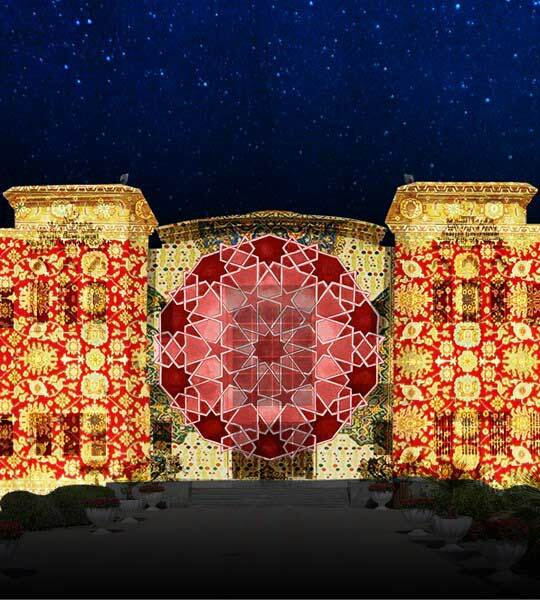 It Features numerous light installations of giant flowers that are illuminated throughout the fest inspired by the beautiful floral displays in Old Sharjah. The Burgundian creative studio, Art slide show off their graphics skills and imagination by creating an ambience filled with monumental pictures. The magnificent House of Justice gets transformed into a graphical delight that enhances its architectural specifics. Journey through human history to the instances that changed human life after the discovery of fire and artificial lights. Artist Gilbert Coudène portrays the journey of light through human life in this stunning visual installation at Al Hisn Fort. The fort is one of the popular historic landmarks of Sharjah. Artist Syed Atiq ur Rehman shows off his storytelling skills through digital illustration as he makes the exterior surfaces of the Supreme Court for Family Affairs his canvas. 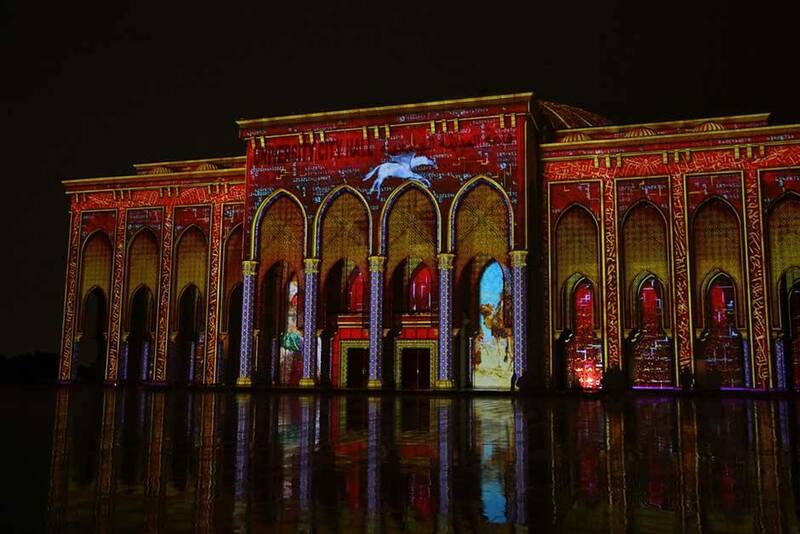 The light show weaves together several Islamic and oriental patterns in an ‘Arabic Fusion’ to present tales of Islamic culture and Sharjah’s rich heritage. Watch the stunning Masjid Ammar Bin Yasser gleam in surreal hues of Aurora Borealis. Artist Pierre-Julien Fieux of France turns the façade into a chromatic masterpiece where the colours create a serene scenario through calm and slow movement of digitally projected visual. 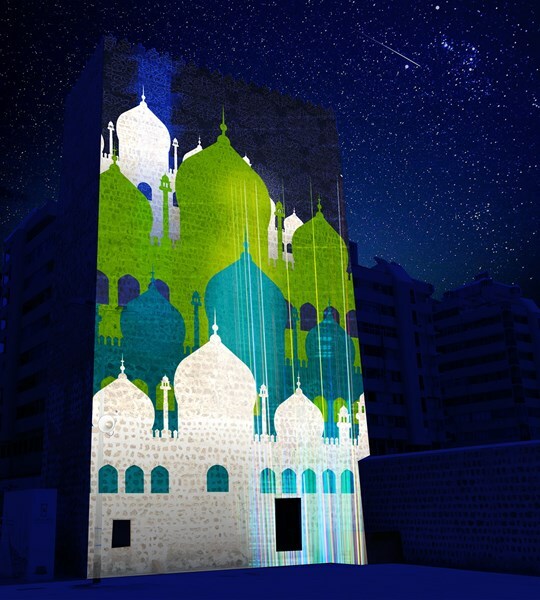 The combined creative force of artists from New York, London, Paris takes over the Kalba region to showcase an amazing video mapping art featuring space, architecture, and art combined with inspired writing. The Young Talent Design Team puts forth their best art scene to create a tribute to Sharjah’s rich culture and heritage scenario. 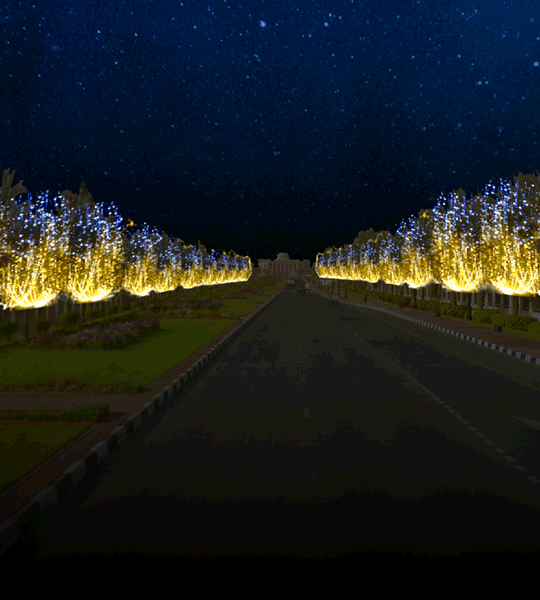 The sprawling street of the University City Campus is adorned in millions of LED pixels that light up the avenue which is said to be thrice the size of Champs Elysees of Paris. Sharjah University City is Sharjah’s pioneering institute for academic excellence. Combining an efficient lighting solution along with the creative concepts of education and culture, artist François Decourbe presents this visual spectacle that celebrates the gift of learning through its brilliantly illuminated installations. 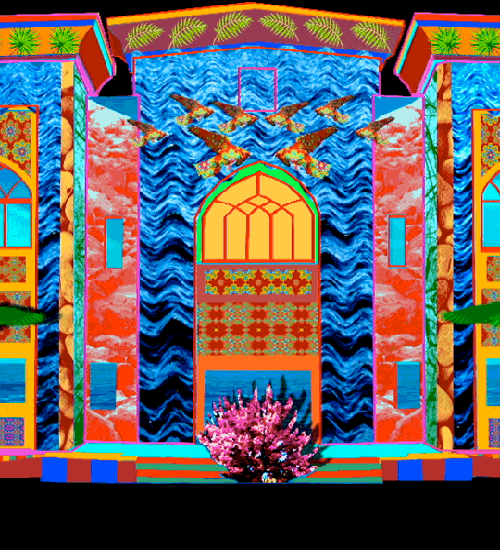 A tribute to Khorfakkan Heritage bought alive by Alice Haldenwang, this dynamic sound and light show turns pale, barren surfaces of buildings into vibrant patterns and shapes through colourful lights. The brilliant creation of forming magnificent art on plain surfaces will surely make your jaws drop. Another stunning show put together by the Young Talent Design team, witness the wonders of digital and visual effects as the structures in Kalba are adorned in beautiful shades of vivid colours for ten days. 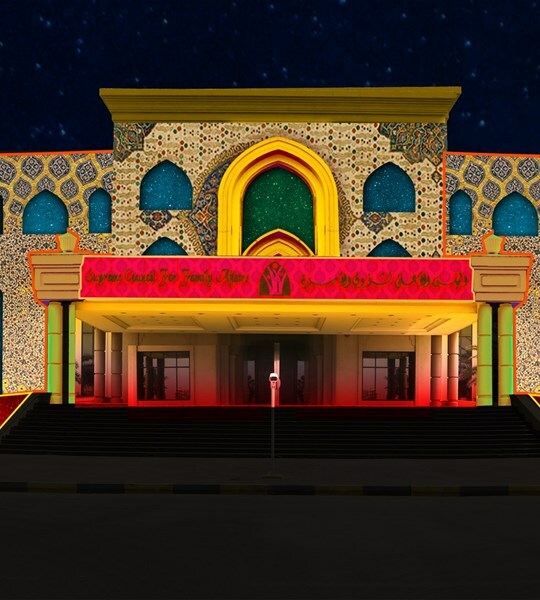 A digital show featuring motion graphics and 3D art of various colourful abstract art and oriental motifs projected on Al Hamriyah’s town hall ’s facades, Artist Esther Megard portrays her imagination through a kaleidoscope of vibrant hues that takes the form of landscapes, various falcons and abstract textures. The beautiful surrounding lagoons of Al Hamriyah Town further enhances the splendour of this illuminating spectacle. « Is it mandatory to have a travel insurance to enter Dubai?